Background: Anthocyanin, a subcategory of flavonoid, is a natural water-soluble pigment. There are many plants rich in anthocyanins, and a high intake of anthocyanin food has been shown to have potential beneficial effects on various chronic diseases. Objective: The objective was to evaluate the contents of total anthocyanin and cyanidin-3-O-glucoside (C-3-G) and their contribution to the antioxidant activities in commonly consumed pigmented plants. Materials and Methods: The total anthocyanin in Lonicera caerulea L., Rubus fruticosus L., Ribes nigrum L., Morus alba L., Zea mays L. seed, Z. mays L. cob, Brassica oleracea L., and Dioscorea alata L. was extracted by tissue-smashing extraction method, and then the contents of total anthocyanin (TAC) and C-3-G contents (C-3-GC) in the purified extracts were determined by pH differential method and high-performance liquid chromatography, respectively. Antioxidant activities were assessed by 2,2-diphenyl-1-picrylhydrazyl, ferric-reducing antioxidant power, and total reducing power (TRP) assays. Results: TAC ranged from 97.11 to 320.27 milligrams cyanidin-3-glucoside equivalents per Gram of dry weight. TAC, C-3-GC, and antioxidant activities in most berry extracts were higher than that in vegetables. Z. mays cob showed the similar TAC, C-3-GC, and antioxidant activities to L. caerulea, and the two vegetables were the lowest. The major anthocyanin in the berries and grains was identified as C-3-G. There was a significant positive correlation between antioxidant activity and TAC. Conclusions: The closer the plant color is to black, the higher TAC is, and the stronger its antioxidant activity is. Z. mays cob will be a promising source of anthocyanin. This study provides a theoretical basis for the use of anthocyanin in functional food and further pharmacological research. Abbreviations used: C-3-G: cyanidin-3-O-glucoside; C3GC: cyanidin-3-O-glucoside contents; DPPH: 2, 2-diphenyl-1-picrylhydrazyl; FRAP: Ferric-reducing antioxidant power; HPLC: High-performance liquid chromatography; TAC: Total anthocyanin content; TAE: Total anthocyanin extract; TE: Trolox equivalent; TRP: Total reducing power; TPTZ: 1,3,5-tri (2-pyridyl)-2,4,6-triazine; TSE: Tissue-smashing extraction. Zea mays L. cob with high bioactivity is also a promising source of anthocyanins. Anthocyanin, also known as anthocyanin, is a water-soluble natural vacuolar pigment that could impart color in plants (leaves, stems, roots, flowers, and fruits) to appear red, purple, or blue depending on the pH and their structural features. The anthocyanidin (or aglycon) consists of an aromatic ring (A) bonded to an heterocyclic ring (C) that contains oxygen, which is also bonded by a carbon–carbon bond to a third aromatic ring (B), and it also belongs to the flavonoid family. There are 23 anthocyanidins found in nature; however, only six (cyanidin, peonidin, petunidin, malvidin, pelargonidin, and delphinidin) are commonly found in edible plants [Figure 1]. There have been more than 635 different types of anthocyanins identified in nature. Various types of anthocyanins are differentiated in their chemical structure, such as the number of hydroxyl groups; number, nature, and position of the sugars attached; and acylation of sugars with acids. Anthocyanin is highly unstable and susceptible to degradation by pH, light, temperature, chemical structure, and oxygen., Hence, it is important to choose the appropriate extraction method. Due to the various benefits of anthocyanin, breeding and production of more anthocyanin-rich plants for enhanced health benefits has attracted attention. More and more new types of anthocyanin-rich plants have emerged, such as black rice, Z. mays, B. oleracea, R. fruticosus, and D. alata. These plants are closely related to our life. Anthocyanin not only increases the ornamental value for plants, but also has been proven to have metabolic and nutritional benefits. Plants have diversity, and their anthocyanin content and biological activity will be different. However, it is rare to have comprehensive comparative research on anthocyanins of commonly consumed plants (fruits, vegetables, and grains). In addition, humans must eat a large amount of food every day to maintain the body's activities. High intake of foods rich in anthocyanins not only provides essential nutrients to the body, but also has potential health beneficial effects on various chronic diseases. Therefore, the main objective of this study is to evaluate the total anthocyanin activity and its contribution to the antioxidant activities of high consumption of berries, vegetables, and grains of rich anthocyanins. These results will provide the theoretical basis for the further pharmacological research and utilization of anthocyanin. KQ-250B-type ultrasonic cleaner (Kunshan Supersonic Instrument Corp., Ltd., Jiangsu, China), R201B rotary evaporimeter (Shanghai Shensheng Biotechnological Corp., Ltd., Shanghai, China), WFZ ultraviolet (UV)-2000 UV and visible spectrophotometer (Shanghai Unico Instrument Corp., Ltd., Shanghai, China), PHS-3C pH meter (Shanghai Precision Scientific Instrument Co., Ltd., Shanghai, China), JHBE-50S smashing tissue extractor (Henan Jinding Development Co., Ltd, Henan, China), LC-20AT high-performance liquid chromatography (HPLC) (Shimadzu Corporation, Kyoto, Japan), and Infinite M 200 Microplate Reader (Swiss Tecan, Männedorf, Swiss) were used. Standard cyanidin-3-O-glucoside (C-3-G) was purchased from Biopurify Phytochemicals Ltd., Sichuan, China. Trolox, 1, 3, 5-tri (2-pyridyl)-2, 4, 6-triazine (TPTZ), and 2,2-diphenyl-1-picrylhydrazyl (DPPH) were purchased from Aladdin Biotechnology Co., Ltd. Diaion® HP-20 macroporous resin was purchased from Mitsubishi, Japan. All chemical reagents were of analytical grade. Berries (Lonicera caerulea L., Rubus fruticosus L., Ribes nigrum L., and Morus alba L.), grains (Zea mays L. seed and cob), and vegetables (Brassica oleracea L. and Dioscorea alata L.) were analyzed [Figure 2]. These fully ripen plants were randomly harvested from planting bases depending on the ripening time of the analyzed species [Table 1]. Approximately 200 g of each sample was immediately placed in an airtight preserving box containing ice bags and then extracted. Anthocyanins were extracted by the tissue-smashing extraction method. Accurately 100 g of each fresh sample was properly sliced and placed in a smashing tissue extractor containing 300 ml of 50% ethanol solution (pH 2), and then the mixtures were smashed for 90 s. The supernatants were filtered. The residue was subsequently sonicated in a KQ-250B-type ultrasonic cleaner containing the solution at above 20°C for 40 min and then filtered. The two supernatants were combined and concentrated to make ethanol free by rotary evaporation at 40°C to obtain crude extract. The crude extract was then added to a chromatography column with macroporous resin for enrichment and purification. The resin was washed with distilled water to remove proteins, polysaccharides, and other water-soluble impurities, until the eluent was colorless. Then, the eluate was collected with 60% ethanol (pH 3) and dried by a rotary evaporator at 40°C. The total anthocyanin extract (TAE) powder was weighed and stored at −20°C. MW = Cyanidin-3-glucoside molecular weight (449.2), L = Cell path length (usually 1 cm); DF = Dilution factor; ε = Cyanidin-3-glucoside molar absorptivity (26,900); V = The final volume (ml), and Wt = Extract weight (mg). Purified TAE (10 mg) and C-3-G standard (2 mg) were dissolved in methanol solution with 2% hydrochloric acid (pH 3) to a volume of 10 ml prior to passing through a 0.45-μm membrane filter, to obtain sample and standard solutions, respectively. These solutions were analyzed using a LC-20AT HPLC with the following chromatographic conditions: 20RBAX Eclipse XDB-C18 column (5 μm, 4.6 mm × 250 mm). Column temperature was set at 30°C and at a flow rate of 1.0 ml/min. The mobile phase included the use of acetonitrile as solvent A and 0.1% phosphoric acid in water as solvent B. The gradient elution: 0-15 min, A(5%–20%): B (95%-80%). Anthocyanins were determined at 520 nm. The injection volume of standard and TAE was 5 μl and 10 μl, respectively. The C-3-G content was calculated based on the peak area, and the result was expressed as mg/g DW. Where Am is the absorbance of DPPH alone, Ap is the absorbance of DPPH and extract, and Ac is the absorbance of the extract only. All samples were tested in triplicate. The ferric-reducing antioxidant power (FRAP) assay measures the ability of antioxidants in TAE to reduce ferric-tripyridyl-triazine (Fe3+−TPTZ) complex into the blue-colored ferrous form (Fe2+) which absorbs light at 593 nm. The FRAP assay was determined according to the method of Benzie, et al. with some modifications. A standard or sample extracts (50 μl) were mixed with 150 μl of ferric-TPTZ reagent (prepared by mixing 100 mM acetate buffer, pH 3.6, 10 mM TPTZ in 40 mM HCl, and 20 mM FeCl36H2O at a ratio of 10:1:1 (v/v/v) and added to the wells. The plate was incubated at room temperature for 10 min of the reaction. Then, the absorbance at 593 nm was recorded. Trolox was used as standard and the antioxidant activities were expressed as mg TE/g DW. The reducing power was carried out on the basis of a previous literature. Various concentrations of TAE (500 μl) were mixed with 2.5 ml of 200 mM sodium phosphate buffer (pH 6.6) and 2.5 ml of 1% potassium ferricyanide. The mixture was incubated at 50°C for 20 min. After 2.5 ml of 10% trichloroacetic acid (w/v) was added, the mixture was centrifuged at 4000 rpm for 10 min. The upper layer (2.5 ml) was mixed with 2.5 ml deionized water and 0.5 ml of 0.1% of ferric chloride. The absorbance was measured at 700 nm. Trolox was used as the standard, and higher absorbance indicates higher reducing power. The assays were carried out in triplicate and the results were expressed as mg TE/g DW. Results were expressed as mean ± standard deviation. One-way analysis of variance tests and Pearson's correlation analysis were performed using SPSS version 22.0 analysis software (SPSS Inc., Chicago, IL, USA). P < 0.05 was considered statistically significant. Anthocyanin is the most likely form of pigment found in plants and is safe, nontoxic, and harmless, which is often used as a natural colorant for food production and processing. Recently, anthocyanins have been widely concerned because of their strong biological activity. Highly pigmented fruits such as blueberry, cherry, and strawberry have been heavily studied, and anthocyanins have been shown to be easily absorbed to contribute significantly to the antioxidant activity in vitro. The separation of monomeric anthocyanin is quite complex and its biological activity is not as good as the total anthocyanin purification. Generally, the enriched and purified total anthocyanin is used for research. Hence, understanding TAC in each plant has an important role in pharmacological study. From [Table 2] and [Figure 3]d, it can be observed that TAC in the eight fresh plants ranged from 97.11 to 320.27 mg C-3-G/g DW, and TACs of the berries were higher than that of Z. mays seed and vegetables, this result is consistent with previous studies. TAC of L. caerulea in the berries was relatively higher than that of other fruits, reaching 320.27 ± 12.13 mg C-3-G/g DW, which was slightly higher than that of previous study. These discrepancies are possibly attributed to the cultivars, maturing status, and extraction methods. TAC in Z. mays cob was also significantly higher than that of the seed (317.51 ± 9.30 mg C-3-G/g DW, P < 0.05), which was higher than previously reported from Anhui (92.3 mg/100 g), Mexico (72.1 mg/100 g), and Canada (127.7 mg/100 g)., There was no significant difference in TAC between L. caerulea extract and Z. mays cob extract. However, the extraction yield of L. caerulea was higher [1.56%, [Table 2]]. The two vegetables (D. alata and B. oleracea) had the lowest TAC and color [Figure 2] and [Figure 3]d. These results suggested that the darker the plant is, the higher the TAC is. Feng et al. found that TAC in blackberries was higher than that in red berries. Although this study found that TAC in most berries was higher than that in grains and vegetables, the anthocyanin-rich berries were not suitable for large-scale development and utilization, due to seasonal, expensive, high moisture content, and difficult to preserve and transport nature. Grains and vegetables of high anthocyanins are cheap and widely distributed, which will be a promising source for anthocyanin. 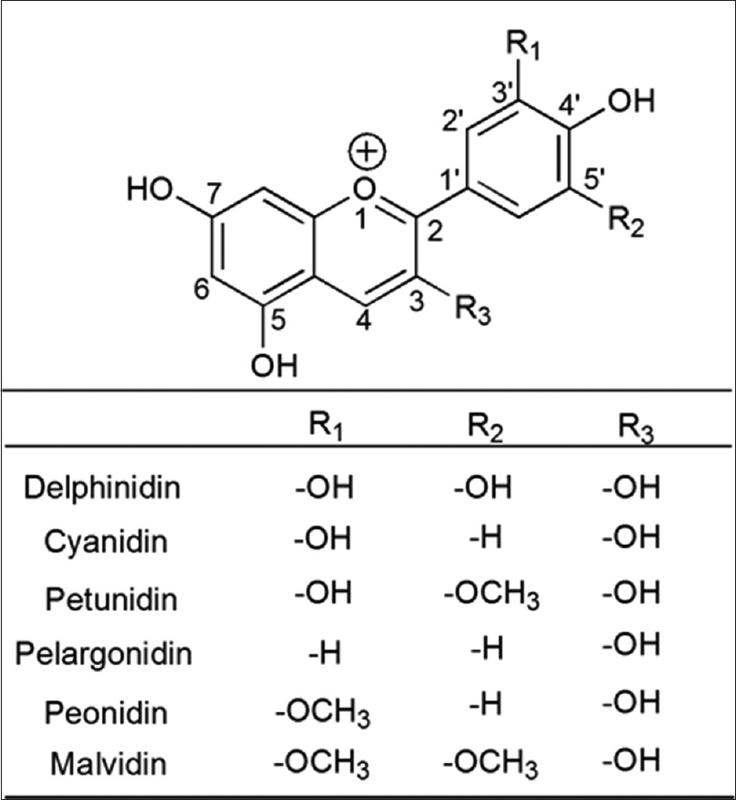 In nature, the distribution of the six more common anthocyanidins in food plants is as follows: cyanidin (50%), delphinidin (12%), petunidin (7%), peonidin (12%), pelargonidin (12%), and malvidin (7%). Free anthocyanins are extremely rare, and most anthocyanins are glycosylated or acylated by different sugars and aromatic or aliphatic acids on their aglycon unit. The most common anthocyanin is the C-3-G. Numerous studies have shown that the major anthocyanin in the berries and cereals identified was C-3-G and they are more stable under heat, light, and acidic conditions than others.,, Lots of evidence had proved that C-3-G exhibited anti-aging, anti-cancer, and liver and kidney protective effects.,, Therefore, C-3-G content (C-3-GC) in eight plants was determined by HPLC. The linear relationships between peak area and concentrations were evaluated using C-3-G standards at different concentrations. The results showed that it had a good linear relationship when the concentration was between 0.0004 and 0.002 mg/ml. The calibration curve was Y (peak area) = 327548X (C-3-G) −6080.45 (R2 = 0.999). By comparing the retention time and calculating the peak area, it was found that C-3-G was present in all the eight plants and C-3-GC ranged from 44.30 to 288.28 mg C-3-G/g DW [Table 2]. C-3-G was indeed predominant in the berries and grains, and there are few other components [Table 2] and [Figure 4], this is in agreement with previously reported data. The C-3-GC in seed and cob extracts of Z mays reached up to 90.4% and 90.6%, respectively [Table 2] and [Figure 4]. However, B. oleracea and D. alata contained a large number of other anthocyanins. Seeds and cobs of Z. mays are excellent sources for C-3-G that has a potential for cancer prevention. Anthocyanin has a strong antioxidant and free radical scavenging ability because it belongs to the widespread class of flavonoid compounds. The pollution of the external environment, pesticide residues, and unhealthy habits will cause the organism to produce excessive free radicals, but these radicals cannot be cleared in time and they could damage other tissues and cells, causing a variety of diseases. Therefore, it has great benefit for the body to supplement a large number of free radical scavengers. Although there have been many plant foods rich in anthocyanins, their antioxidant activities are also different. In this study, DPPH, FRAP, and total reducing power (TRP) assays were measured to evaluate the antioxidant activities of eight plants in vitro. The ability to scavenge free radicals was found to be the strongest compared with the other two assays [Figure 3]. In DPPH assay, their DPPH values ranged from 84.55 ± 19.67 to 574.12 ± 17.91 mg TE/g DW. DPPH values of L. caerulea, R. fruticosus, M. alba, and Z. mays cob were significantly higher, compared with R. nigrum, Z. mays seed, and two vegetables (P < 0.05), and the two vegetables were the lowest [Figure 3]a. This result may be related to TAC. In FRAP assay, there was a great difference in ferric-reducing antioxidant capacity, ranging from 50.16 ± 10.56 to 285.65 ± 23.65 mg TE/g DW. FRAP values in vegetables were also the lowest, when compared with that in the berries and grains. There was no significant difference between the FRAP values in L. caerulea and Z. mays cob [Figure 3]b. This result is the same as that of DPPH value. The TRP of the eight plants ranged from 126.37 ± 22.40 to 328.68 ± 20.98 mg TE/g DW. The TRP values of L. caerulea and Z mays cob were the highest among all the species investigated. However, TRP values of vegetables had no significant difference from that of Z. mays seed [Figure 3]c, indicating that the vegetables also had better reducing power. Antioxidant capacity in different berries was also different, suggesting that the darker the color is, the stronger the antioxidant capacity is. Feng et al. discovered that blackberries demonstrated much higher antioxidant activities than the red berries. Pearson's correlation analysis of TAC, DPPH, FRAP, and TRP found that there was a significant positive correlation between TAC and the three antioxidant assays [Table 3]; r = 0.953, 0.985, and 0.818, respectively]. The ability to scavenge free radicals increases as TAC increases, the results of which are in agreement with previously reported data., In this way, people can use color as one of the conditions for screening foods with high antioxidant capacity. There was also a significant correlation between DPPH, FRAP, and TRP [Table 3]; r = 0.943, 0.854, and 0.821, respectively]. At present, it is well known that the nutritional value of black foods such as blueberry, purple grape, and black bean is higher than that of apples, soy beans, and other light-colored foods, and has good anti-aging, anti-inflammatory, anti-bacterial, and cardiovascular and cerebrovascular system protection effects, all of which owe to the high content of anthocyanins. The darker the color is, the higher the TAC is, and the stronger their antioxidant capacity is., Strong antioxidant capacity of anthocyanin provides an important basis for further pharmacological research and clinical applications. In the present study, anthocyanin content varies greatly among different plants. TAC and antioxidant activity are higher in most berries than in vegetables and grains, followed by grains, and the major anthocyanin in the berries and grains was identified as C-3-G. Two vegetables showed the lowest TAC, C3GC, DPPH, FRAP, and TRP values. This study demonstrated that the closer the plant color is to black, the higher its TAC is, and the stronger its antioxidant activity is. In addition, Z. mays cob has the TAC, C-3-GC, and antioxidant activity as berries, with the characteristics of wide source, cheap price, and easy to preserve and transport, and it is also a promising source of anthocyanins. However, whether the Z. mays cob anthocyanins play a great role in vivo and what the mechanism of exertion is needs further research. This study provides a theoretical basis for the use of anthocyanin in functional food and further pharmacological research. This project is sponsored by Zhejiang Provincial Natural Science Foundation of China (LY13H280011). Cooper-Driver GA. Contributions of Jeffrey Harborne and co-workers to the study of anthocyanins. Phytochemistry 2001;56:229-36. He J, Giusti MM. Anthocyanins: Natural colorants with health-promoting properties. Annu Rev Food Sci Technol 2010;1:163-87. Hernández-Herrero JA, Frutos MJ. Colour and antioxidant capacity stability in grape, strawberry and plum peel model juices at different pHs and temperatures. Food Chem 2014;154:199-204. Mojica L, Berhow M, Gonzalez de Mejia E. Black bean anthocyanin-rich extracts as food colorants: Physicochemical stability and antidiabetes potential. Food Chem 2017;229:628-39. Yu F, Zhao GJ, Li XS, Chen XL, Li W, Sun Z. Research progress of anthocyanin compounds. Mod Food 2017;19:21-6. Bagchi D, Garg A, Krohn RL, Bagchi M, Bagchi DJ, Balmoori J, et al. 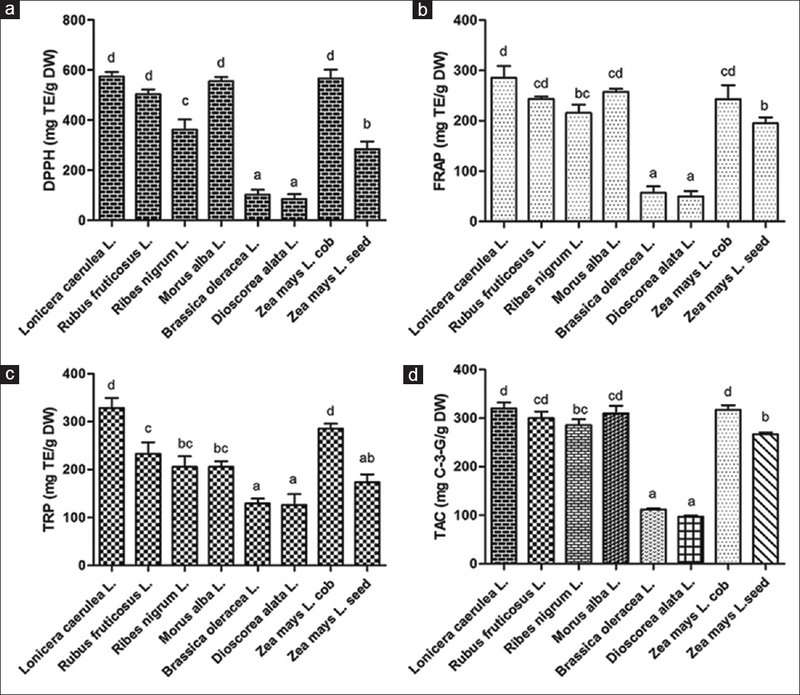 Protective effects of grape seed proanthocyanidins and selected antioxidants against TPA-induced hepatic and brain lipid peroxidation and DNA fragmentation, and peritoneal macrophage activation in mice. Gen Pharmacol 1998;30:771-6. Hou DX, Kai K, Li JJ, Lin S, Terahara N, Wakamatsu M, et al. Anthocyanidins inhibit activator protein 1 activity and cell transformation: Structure-activity relationship and molecular mechanisms. Carcinogenesis 2004;25:29-36. Matsui T, Ebuchi S, Kobayashi M, Fukui K, Sugita K, Terahara N, et al. Anti-hyperglycemic effect of diacylated anthocyanin derived from Ipomoea batatas cultivar Ayamurasaki can be achieved through the alpha-glucosidase inhibitory action. J Agric Food Chem 2002;50:7244-8. De Pascual-Teresa S, Sanchez-Ballesta MT. Anthocyanins: From plant to health. Phytochem Rev 2008;7:281-99. Konczak I, Zhang W. Anthocyanins-more than nature's colours. J Biomed Biotechnol 2004;2004:239-40. Simon PW. Plant pigments for color and nutrition. Hortscience 1997;32:12-3. Li HY, Deng ZY, Zhu HH, Hu CL, Liu RH, Young JC. Highly pigmented vegetables: Anthocyanin compositions and their role in antioxidant activities. Food Res Int 2012;46:250-9. Wu T, Yan J, Liu R, Marcone MF, Aisa HA, Tsao R. Optimization of microwave-assisted extraction of phenolics from potato and its downstream waste using orthogonal array design. Food Chem 2012;133:1292-8. Ferreira IC, Baptista P, Vilas-Boas M, Barros L. Free-radical scavenging capacity and reducing power of wild edible mushrooms from Northeast Portugal: Individual cap and stipe activity. Food Chem 2007;100:1511-6. Pazmiño-Durán AE, Giusti MM, Wrolstad RE, Glória BA. Anthocyanins from Oxalis triangularis as potential food colorants. Food Chem 2001;75:211-6. Kong JM, Chia LS, Goh NK, Chia TF, Brouillard R. Analysis and biological activities of anthocyanins. Phytochemistry 2003;64:923-33. Yang Z, Zheng Y, Cao S. Effect of high oxygen atmosphere storage on quality, antioxidant enzymes, and DPPH-radical scavenging activity of Chinese bayberry fruit. J Agric Food Chem 2009;57:176-81. Del Bo' C, Cao Y, Roursgaard M, Riso P, Porrini M, Loft S, et al. Anthocyanins and phenolic acids from a wild blueberry (Vaccinium angustifolium) powder counteract lipid accumulation in THP-1-derived macrophages. Eur J Nutr 2016;55:171-82. Giusti MM, Wrolstad RE. Acylated anthocyanins from edible sources and their applications in food systems. Biochem Eng J 2003;14:217-25. Fabroni S, Ballistreri G, Amenta M, Romeo FV, Rapisarda P. Screening of the anthocyanin profile and in vitro pancreatic lipase inhibition by anthocyanin-containing extracts of fruits, vegetables, legumes and cereals. J Sci Food Agric 2016;96:4713-23. Feng C, Su S, Wang L, Wu J, Tang Z, Xu Y, et al. 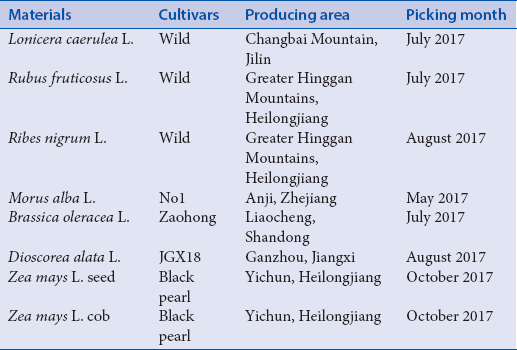 Antioxidant capacities and anthocyanin characteristics of the black-red wild berries obtained in Northeast China. Food Chem 2016;204:150-8. Dep Pozo-Insfran D, Brenes CH, Serna Saldivar SO, Talcott ST. Polyphenolic and antioxidant content of white and blue corn (Zea mays L.). Food Res Int 2006;39:696-703. Yang ZD, Zhai WW. Identification and antioxidant activity of anthocyanins extracted from the seed and cob of purple corn (Zea mays L.). Innov Food Sci Emerg Technol 2009;11:169-76. Escribano-Bailón MT, Santos-Buelga C, Rivas-Gonzalo JC. Anthocyanins in cereals. J Chromatogr A 2004;1054:129-41. Olivas-Aguirre FJ, Rodrigo-García J, Martínez-Ruiz ND, Cárdenas-Robles AI, Mendoza-Díaz SO, Álvarez-Parrilla E, et al. Cyanidin-3-O-glucoside: Physical-chemistry, food omics and health effects. Molecules 2016;21. pii: E1264. Palíková I, Heinrich J, Bednár P, Marhol P, Kren V, Cvak L, et al. Constituents and antimicrobial properties of blue honeysuckle: A novel source for phenolic antioxidants. J Agric Food Chem 2008;56:11883-9. Lim TG, Kwon JY, Kim J, Song NR, Lee KM, Heo YS, et al. Cyanidin-3-glucoside suppresses B[a] PDE-induced cyclooxygenase-2 expression by directly inhibiting Fyn kinase activity. Biochem Pharmacol 2011;82:167-74. Ma BL, Liang SF, Xie YF. A study on separation and stability of cyanidin from Pyracantha fortuneana. J Northwest For Univ 2006;21:162-5. Park KH, Gu DR, So HS, Kim KJ, Lee SH. Dual role of cyanidin-3-glucoside on the differentiation of bone cells. J Dent Res 2015;94:1676-83. Tsuda T, Horio F, Uchida K, Aoki H, Osawa T. Dietary cyanidin 3-O-beta-D-glucoside-rich purple corn color prevents obesity and ameliorates hyperglycemia in mice. J Nutr 2003;133:2125-30. Serafino A, Sinibaldi-Vallebona P, Lazzarino G, Tavazzi B, Rasi G, Pierimarchi P, et al. Differentiation of human melanoma cells induced by cyanidin-3-O-beta-glucopyranoside. FASEB J 2004;18:1940-2. Wang LJ, Su S, Wu J, Du H, Li SS, Huo JW, et al. Variation of anthocyanins and flavonols in Vaccinium uliginosum berry in lesser Khingan mountains and its antioxidant activity. Food Chem 2014;160:357-64. Giovanelli G, Buratti S. Comparison of polyphenolic composition and antioxidant activity of wild Italian blueberries and some cultivated varieties. Food Chem 2009;112:903-8. Garg M, Chawla M, Chunduri V, Kumar R, Sharma S, Sharma NK. Transfer of grain colors to elite wheat cultivars and their characterization. J Cereal Sci 2016;71:138-44. Yi W, Akoh CC, Fischer J, Krewer G. Effects of phenolic compounds in blueberries and muscadine grapes on hepg2 cell viability and apoptosis. Food Res Int 2006;39:628-38.